Beautiful...Fresh...Delicious Food ...Popping with Pizzazz! 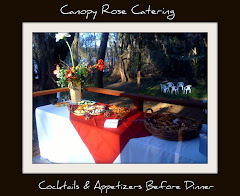 So what is it that sets the catering and event design of Canopy Rose apart from other Tallahassee area caterers? Is it passion, culinary creativity, extraordinary experience? What is that special something that makes Canopy Rose Catering stand head and shoulders above the crowd of caterers? We cordially invite you to scroll, scroll, scroll through all our deliciousness and taste our fabulousness for yourself. 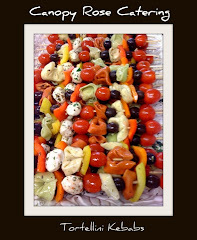 Catering in Tallahassee, Florida at Dorothy B. Oven by Canopy Rose Catering on January 17, 2014. 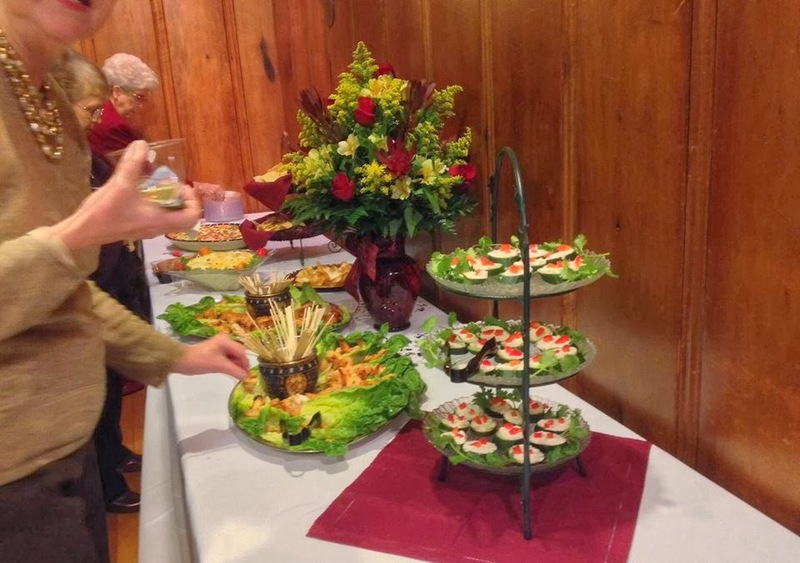 On January 17, 2014 the Canopy Rose Catering team had the wonderful opportunity to cater a very special retirement party at Dorothy B. Oven Park. The planning committee went to town selecting a unique flavor-popping menu. 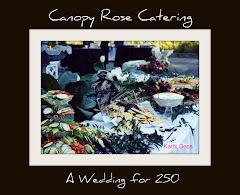 To discuss the possibility of having Canopy Rose Catering cater your next function, contact Chef Kathi at 850-539-7750 or at canopyrose@aol.com to check availability. Serving Greater Tallahassee, North Florida, South Georgia and many coastal and beach communities along the Gulf of Mexico. 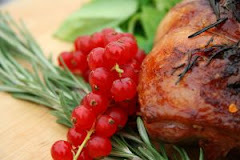 Our extensive mix and match catering menus follow. Simply click on each category on the top right side of the website, to pull up a list of options. For those seeking a turn-key catering solution.... our catering packages for receptions, banquets and holidays are simply perfect. These catering packages are also listed along the right side of the website. For those looking for a highly original menu and theme for their event- Canopy Rose Catering's creativity and ability to create the WOW Factor is legendary! 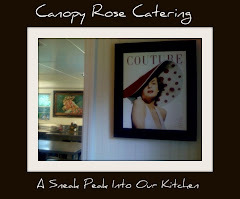 Don't miss the section on our unique catering stations for a taste of the fun of having a Canopy Rose Catered Event! We really enjoy custom designing your catering for each different event and prefer to talk over the phone, communicate by e-mail or meet in person over a cup of coffee. 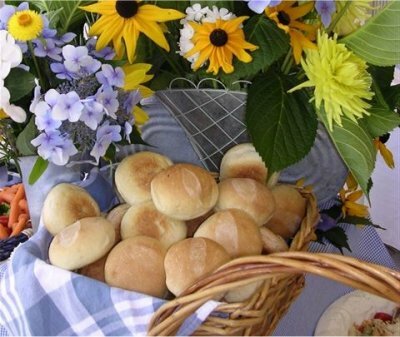 Please make an appointment with Kathi Bess to discuss your Party and Catering needs. Call 850-539-7750 or email us at canopyrose@aol.com. Make sure and ask us about any catering specials we are running for the month. The specials are a great way to treat your office, family and friends to the delicious foods of Canopy Rose. Have a big group and a small budget? 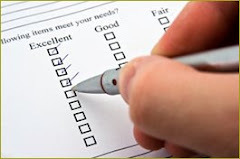 Don't hesitate to ask us to help you. 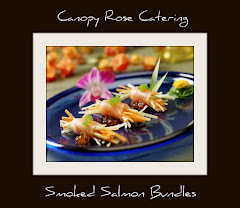 Canopy Rose is very creative in providing affordable, cost-effective catering solutions. Canopy Rose owner, Kathi Dameron has won the 2nd Place Award in the Newspaper Article Category at the 2008 Southern Christian Writer's Conference in Tuscaloosa, Alabama for her article, Simple Act of Sharing Food Can Truly Bring People Together. 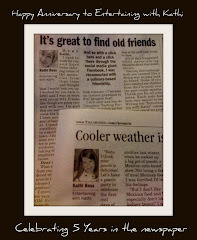 This article appeared in the Northeast Chronicle - Tallahassee Democrat during the spring of 2008 in the Entertaining with Kathi column. The year was 1987 when Kathi Dameron, a passionate gourmet cook who spent her days teaching 32 second graders, and her weekends hosting fun parties for her circle of friends at her waterfront home on Florida's North Hutchinson Island, won two prizes in the first cooking contest she ever entered. One of these prizes was the coveted Grand Prize. At that moment Kathi knew that one day in the not too distant future her special dream to launch her very own catering company would be realized. Seven years later that day arrived with the birth of Canopy Rose in Florida's Capital City in 1994. What's Cooking At Canopy Rose? We are delighted that you are interested in booking the services of Canopy Rose! The process is very simple! 4. A description of the food, services and catering budget you have in mind. Need help planning your event? 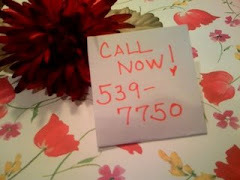 Call Chef Kathi on her direct line at 850-539-7750. Our Celebrate Summer board is full of fabulous pictures and ideas that pay homage to the sizzling days of summer. 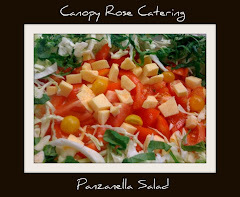 Canopy Rose Culinary Arts Studio and Catering Company is a unique Tallahassee area catering company. The owner is a prize-winning gourmet chef, teacher of cooking classes and the newspaper food columnist who wrote the popular "Entertaining with Kathi" food column. Canopy Rose first bloomed on the Florida Capital Scene in the springtime of 1994 with a pint-sized Tallahassee cafe that presented a dazzling collection of gourmet salads, sandwiches, hot food specials and decadent desserts. 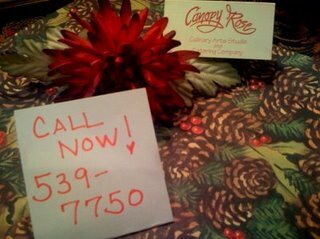 Immediately customers requested Canopy Rose catered foods at their office luncheons, holiday parties, special events and weddings. Within a few years Canopy Rose closed the cafe part of the business and concentrated exclusively on the catering division, soon growing to a large 3000 square foot catering operation in northeast Tallahassee. Catering clients ranged from the Florida Governor's Mansion to indulgent beach parties on St. George Island. 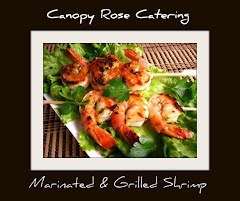 Canopy Rose Catering had become the hottest catering company in town. 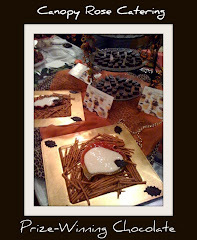 The menus were new and innovative and the presentations were striking. Tallahassee had never seen anything quite like it before. While Canopy Rose Catering could and would cook up the tried and true Southern classics of the region, Chef/Owner Kathi Dameron's unique cosmopolitan interpretations found favor with everyone who secretly yearned for a little more pizzazz on the plate. In 2008, Chef Kathi moved the business to neighboring Havana, Florida where a story-book romance soon unfolded. By the spring of 2009, the wedding caterer, was deep in the throws of planning her own wedding to the most amazing man she had ever met. So amazing was the smitten groom-to-be, that he literally took over the planning of the wedding, his soon-to-be-wife, the unflappable chef-caterer, who had orchestrated parties for thousands, was quite simply totally and completely over-whelmed. 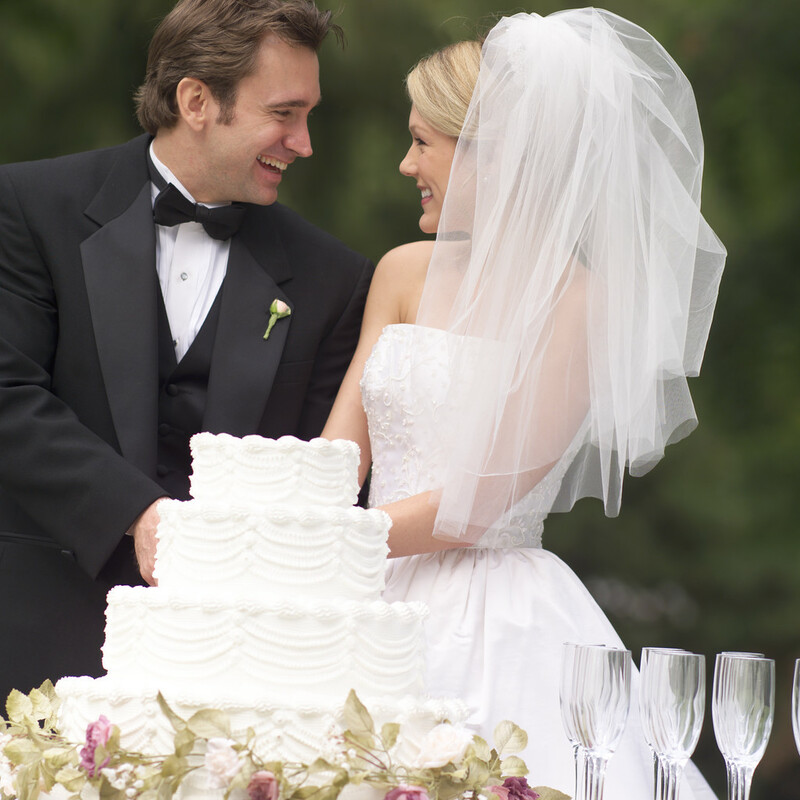 With the marriage, came a dreamy, brand new licensed catering kitchen just steps from the main house. Nineteen years, six different catering kitchens, and Canopy Rose Catering continues to stir up culinary excellence in North Florida. With an on-call staff of over 30 independent contractors who are passionate about parties, Canopy Rose Catering can seamlessly handle any size party in Florida's Capital Region. 4.) an expert on catering and special events. Articles written by Canopy Rose Catering owner, Kathi Dameron have been syndicated internationally to places as far away as New Zealand and Australia. Our highest priority is to provide our catering clients with exceptional service, delicious food, beautiful presentations and perfectly executed event orchestration. It's true! 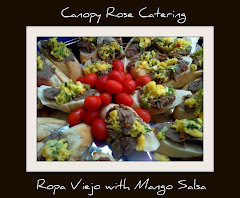 For large groups, Canopy Rose Catering offers substantial discounts! Please ask! We are always happy to help you save money! Tell us your budget and we'll just go from there to help you get the food you want at a price you can afford. Call Kathi at 850-539-7750. Click on the above pic to go to FB and check out our latest ideas. Entertaining with Kathi is now on Facebook, too! Click on the above pic to go to FB. 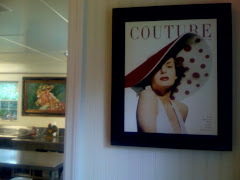 Visit Canopy Rose on Facebook and Become A Fan! We've moved to a brand new catering kitchen. We've moved to a brand new catering kitchen! Don't forget to bookmark this page! 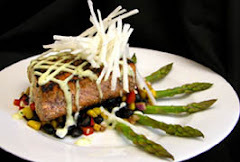 Please come back often and read our latest blog postings that start after the menu selections. If you want to print the catering menu... tell your printer to print only a certain number of pages, otherwise your printer could end up printing 100 or more pages. We love to hear from you! Please send your comments, suggestions and greetings to Kathi. This catering website is designed to provide catering menus, prices and innovative entertaining ideas for the North Florida and South Georgia geographic region. Scroll and Enjoy! 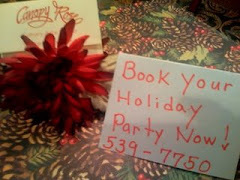 Book Your Holiday Party Today! Pick the plan that is right for you! Perfect for weddings or other elegant special events. 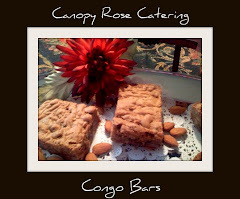 *The Canopy Rose Cocktail Bites are fabulous tasting bite-size savory or sweet hors d'oeuvres. The number of Cocktail Bites listed refers to the number of uniquely different Cocktail Bites in the package. Most Cocktail Bite selections allow for between 2-5 pieces per person. Cocktail Bites are custom-designed for you! 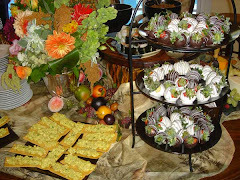 Canopy Rose Catering offers many options for catered banquets. Here are a few possibilities. 10.00 Per Person / 125 person min. 15.00 Per Person / 125 person min. 20.00 Per Person / 125 person min. 25.00 Per Person / 125 person min. 30.00 Per Person / 125 person min. 35.00 Per Person / 125 person min. 40.00 Per Person /125 person min. 45.00 Per Person / 125 person min. 50.00 Per Person / 125 person min. 75.00 Per Person / 125 person min. 100.00 Per Person / 125 person min. For more great holiday dinner or luncheon selections please browse the main menu. Did you know that Canopy Rose is one of Tallahassee's favorite providers of upscale, fun foods for Florida State Seminole football tailgate and tv parties? Canopy Rose was the official caterer of the 2000, 2002 and 2004 Bank of America In The Zone corporate tailgate party for the FSU Seminoles vs. UF Gators Game. Estimated guest count was between 1200 and 1800 guests! In 2006 Canopy Rose was unavailable. 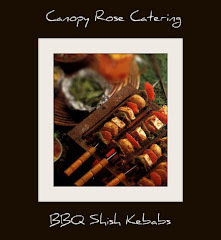 Call today to check Canopy Rose's availability to cater your tailgate event in Tallahassee. Your guests will be glad you did! The food is to die for! A Fabulous Concept That Your Guests Will Love! Did you know that most anything on the Canopy Rose menus can be tweaked and served in bite-size portions? Naturally the price per person is significantly reduced, too! 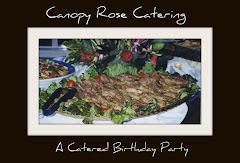 Canopy Rose has hundreds of gorgeous photos from events we have catered since 1994. Most of these photos are not available on line. However, with the simplicity of snapping photos and downloading them these days, Canopy Rose will be sharing many of our favorite shots on this website. Who knows maybe we will even share some event videos, too! Freelance videographers looking for part time on-call work can contact Kathi. Canopy Rose Catering creates delicious, heart-healthy and beautiful vegetarian appetizers, salads, soups, side dishes, sandwiches and entrees, too. Whether you want one or two vegetarian or vegan catered entrees or your desire is for an entire vegetarian or vegan catered menu Canopy Rose Catering can help you! Just let us know. Vegetarian Wedding Receptions By Canopy Rose Catering. 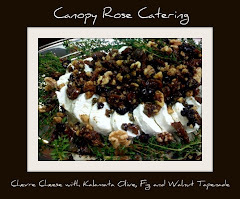 Did you know that Canopy Rose creates a line of Lite and Luscious Foods? Many more possibilities available on request. Looking for delicious diabetic-friendly foods? Canopy Rose custom creates delicious recipes for diabetics that can be ordered in advance by calling 850-539-7750. Imagine a freezer full of fabulous food... packaged in customized quantities just for you! One of the best kept secrets in North Florida and South Georgia is the line of Frozen Blessings from Canopy Rose. From breakfast breads to holiday hors d'oeuvres! The possibilities are unlimited! The warm and inviting kitchens and dining rooms of my Jewish grandparents, great-aunts, and great-uncles instilled in me a life long appreciation and love for Jewish foods. Holiday, Wedding and Special Event Party Staff - Catering Dept. 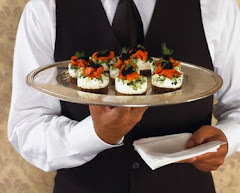 Earn extra income while working some of the area's most spectacular catered parties. We occasionally have part-time on call job opportunities in our catering department for nice, conscientious, nice, hard-working, honest, nice, professional and nice hospitality-orientated folks. Did we mention nice? You get the idea. We want staff who have a heart to serve others! 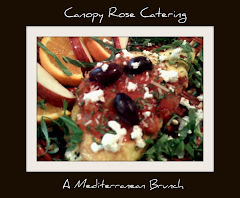 Canopy Rose Catering cuisine is deliciously diverse in flavor and inspiration. Chef/ Owner Kathi Dameron frequently flavor jaunts to far-flung ports of call when creating her unique seasonally-inspired dishes. But she doesn't stop there! This innovative culinary artist whose studio is in the quaint, artsy and historic district of Havana, Florida (12 miles from Tallahassee- Florida's beautiful capital city) scores home-run after home-run in the kitchen by uniting intriguing international flavors and regional favorites. Think of a beautiful red rose! Our name is Canopy Rose (like the flower), not Canopy Road or Canopy Roads. Canopy Rose (like the flower) Culinary Arts Studio and Catering Company is NOT affiliated with the breakfast and lunch cafe on North Monroe Street in Tallahassee that is named Canopy Road. 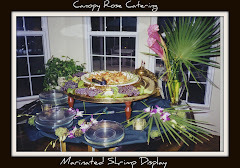 Canopy Rose is an off-premise catering and special event company that serves Leon, Gadsden, Jefferson, Wakulla, Franklin and other nearby counties. Q: How do I place a lunch catering order? A: Call 850-539-7750 to place your order. Q: How far in advance do I need to call? A: As soon as you know that you are going to be needing a luncheon catered. We have clients who book their events months in advance. Q: Is there a minimum? A: For the majority of our foods on this menu, we have an 10 person minimum. Q: Do you deliver and is there a delivery fee? A: Yes, we deliver all around the Tallahassee area. Delivery fees usually start at $25.00 You will be told what your delivery fee will be when you place your order. Q: Are you licensed and insured? A: Yes, we are licensed through the Florida Department of Business and Professional Regulation. And yes we carry 2,000,000.00 + product liability insurance. Q: Do you do other types of catering beside office luncheons. I was wondering if you could cater our firm's open house, annual holiday party and our board of director's monthly dinner meetings? A: Yes. We cater a wonderful assortment of special events for the business community. We also cater legislative functions, charity galas, birthday parties and wedding receptions. For a menu please call Kathi Dameron at 850-539-7750. Q: Do you give discounts for large orders. Do you give a discount to Tallahassee Chamber of Commerce members? A: Yes. Canopy Rose offers deep discounts for larger groups. Check with Kathi to see if the menu that you are interested in is eligible for a discount. If you are a chamber member your order also may be eligible for a discount, depending on the quantity of food being purchased. Q: Do you give free food donations to charitable events? A: Canopy Rose would love to give free food to every wonderful and worthwhile charitable cause, so it certainly doesn't hurt to ask. Please request a copy of our Charitable Food Donation Request Form. Complete it and include a list of three individuals in your oganization that have catered an event with Canopy Rose or purchased Canopy Rose Foods-To- Go from us during the last 12 months. Q: Do you go outside the Tallahassee area to cater events? Our daughter is getting married on St. George Island and we would love for you to cater her wedding reception with your amazing food. A: Yes! Canopy Rose caters all across the Gulf Coast of Florida. Q: We are having a small dinner party at our home in 2 weeks. Can I order foods from this menu for our party? A: Absolutely, unless our calendar is already booked up. Please try to book your food and entertaining needs with us as soon as possible. You can even pick up the food from our location and save on the cost of delivery. Q: I don't want anyone to know that I hired a caterer. Would you be willing to prepare the food in my dishes? A: Your secret is safe with me! I promise I won't write about you in my newspaper food column or on the internet and I won't tell a soul! Q: We would like to have our party written up on the society page and submitted for publication to Bon Appetit. Can you help us with that? A: Possibly. I am certainly open to the possibilities of writing up a story about your event and submitting it to a magazine or newspaper for publication. One of the marvelous things about being a caterer is the frequent opportunity to play with the cuisines of distant lands. In the Canopy Rose kitchen, I get my fill of ethnic flavor jaunting. For today’s column, I spin the globe to the enchanting land of a thousand curries. The inspiration to go to India, metaphorically speaking, comes from an event for 225 guests that I will be catering on August 8 near Seaside, Florida. An excellent way to prime the pump of culinary creativity and get into the rhythm for the demanding days ahead, is to cook up a leisurely theme inspired dinner during the more tranquil days that precede party preparation. Indian Tandoori Chicken with Garam Masala Spiced Potato Bites is on the menu for this evening. While I don’t own a tandoor oven, I certainly don’t let that become a stumbling block. After years as a classroom teacher, trailed by a short stint as a make-and-take workshop leader, followed by the birth of Canopy Rose in 1994 - the skill of improvisation and resourcefulness is one I have mastered quite well. The take away lesson- don’t ever let the lack of something, whatever it is, whether it is a tool or ingredient in your home kitchen or the kitchen of your life, keep you from giving something a try. One of the secrets to creating unforgettable Indian dishes is as near as a generous twist of the wrist. It is true! You can sprinkle your way to Indian culinary nirvana with exotic spices. Just don’t expect to do it in an instant. Allow plenty of time for your chicken to marinade in a melange of flavor. For this chicken dish I use plain yogurt, fresh squeezed lemon, minced garlic, minced ginger, a dash of Cumin, Coriander, Cardamom, Cloves, Curry, Sea Salt, Gourmet Pepper, fresh Cilantro and spiked olive oil. Marinate all this with your chicken in the refrigerator in a covered, non-reactive container over night. The next day start the Garam Masala Spiced Potato Bites early by cooking, cooling, then dicing some potatoes. Just before firing up your grill for the chicken, sauté your potato bites over medium-high heat with olive oil, chili powder, garam masala, curry, sea salt and other fragrant spices. Now add some Indian Raja music for mood and get set for some down right delicious dining.